Patient of Dr Ciara Scott, Specialist Orthodontist, HSE. Teenage years are difficult enough but to be told at 12 years of age that part of your lower jaw is dissolving, and will “underhang” as the rest of your face continues to grow, could be devastating. However, in “some bizarre way”, it was news Rebecca Heasley from Greystones, Co Wicklow, had been expecting. She knew “something wasn’t quite right” with her mouth. When an orthodontist at St Colmcille’s Hospital, Loughlinstown, referred her to Prof Gerry Kearns at St James’s Hospital in Dublin, she said she “wasn’t really surprised”. It was in consultations with Kearns at the National Maxillofacial Unit at St James’s that Rebecca heard for the first time the words “diopathic condylar resorption”. This is a rare condition in which a jaw becomes misshapen and can result in difficulty eating and even breathing. 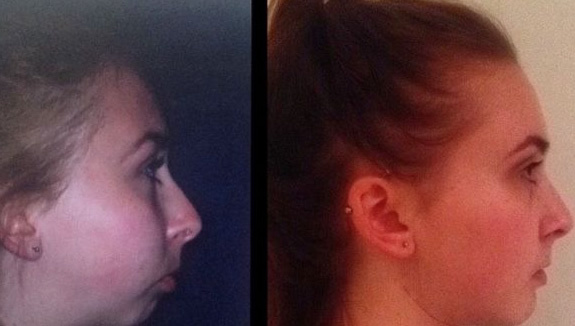 On the cusp of starting secondary school, Rebecca was told the condition could be addressed by surgery, but not until the rest of her face was fully grown, at the other end of adolescence. Her lower jaw would continue to recede while the upper one would continue to grow. In the meantime there would be countless consultations and measurements, the removal of excess teeth, and ongoing visits to the orthodontist.